This beautiful and sophisticated Diamond trellis stencil is so classy! You can use this elegant wall design on a dining room wall, in a hallway, in a bath, or as a bedroom accent wall. Also you can stencil it in one color for a uniform effect, or do a two-color look that makes the trellis look 3D! So versatile! Trellis patterns are having a huge comeback and this wall stencil is right on trend. 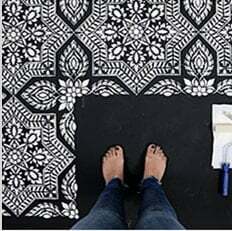 Consider using a stencil for wall painting project instead of purchasing costly and difficult to install trellis wallpaper. This design comes with a FREE TOP EDGE STENCIL: the top part of the design cut as a separate smaller stencil. It makes it easy to fill the gaps in the pattern close to the ceiling line. For stencil repeat instructions please refer to the step-by step photos above. This trellis wall stencil features an easy registration system, just use parts of the previously painted design to align the stencil, check for level and continue. This gives you a seamless "wallpaper" look. Don't worry about super perfect alignment: in the end your eye will never notice the discrepancy.